Over 250 surgeries were rescheduled at various government hospitals in the city on Friday as nurses across the country went on mass casual leave, demanding inclusion of their salaries under the Seventh Pay Commission. The mass casual leave was part of the ongoing weeks long strike, the Nurses Federation had called after their repeated negotiations with the health ministry, who allegedly ignored their demands. As per data from the Ram Manohar Lohia (RML) Hospital, over 80 surgeries were rescheduled while over 50 surgeries were postponed at Safdarjung hospital. “This is the problem we face every time when nurses go on strike but as all of them went on leave as part of their protest, we had a hard time in the hospitals and surgeies had to be delayed,” said Sameer Purkhyasta, a senior surgeon at RML. According to him, junior residents had to perform the work of nurses, as the emergency surgeries could not be delayed. However, there were no law and order problems at the hospital. The Delhi government hospitals where the surgeries got delayed and cancelled included Lok Nayak Jai Prakash hospital, Guru Teg Bahadur and a few others. The nurses are also demanding nursing allowance, risk allowance and night-duty allowance, all as per the Pay Commission recommendations which are yet to be implemented by the central government. A communication by the commission had informed the federation that the recommendations won’t be implementable for them. “We want our payment to be as per the Seventh Pay Commission. Up until now all the pay commissions have been implemented without any problems. Why is the Seventh Pay Commission not being implemented for the nurses?” Aruna Jangia, a nurse with GTB hospital, told IANS. 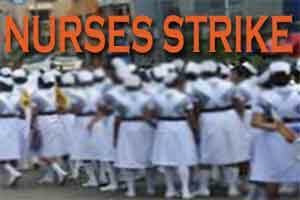 The nurses have also said that if their problems are not being addressed by the government, they would go on permanent strike from March 15 onwards. Howcome ESMA is not invoked when nurses go on strike but is immediately invoked when doctors go on strike for genuine reasons?